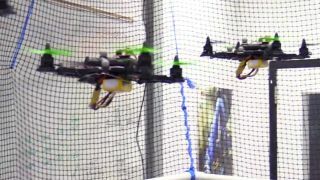 Engineers at Arizona State University have built a system that allows a single person to control a small swarm of quadcopters with just their brain. A traditional joystick is great for controlling a single craft, but it's less useful for controlling multiple drones at once. "You can't do something collectively" with a joystick, said Panagiotis Artemiadis, director of the university's Human-Oriented Robotics and Control Lab. "If you want to swarm around an area and guard that area, you cannot do that." So Artemiadis developed a technique that can, using a skullcap adorned with 128 electrodes. The electrodes measure brain activity, lighting up in particular patterns when the wearer of the cap is thinking of different things. They're wired to a computer, allowing it to recognise different thoughts and act on them accordingly. "If the user is thinking about decreasing cohesion between the drones, we know what part of the brain controls that thought," Artemiadis said. Here's a video of the system in action. Artemiadis added that he was surprised the brain was capable of such a task. "What I didn't know is that the brain cares about things we are not doing ourselves," he said. "We don't have a swarm we control. We have hands and limbs and all that stuff, but we don't control swarms." Yet the brain seems to have the ability to do so, as long as the controller stays focused and doesn't get tired or distracted. "We tell the subject to think of two things," he said. "Focus on breathing, or we tell them to imagine closing their left hand into a fist." Right now, the system can control up to four small robots at once, but there doesn't seem to be any reason why it couldn't be adapted to handle more. Artemiadis hopes that in the future his system could be put into action for complex tasks, like search and rescue.